Green Lake, seen from its eastern shore. The lake's unusual blue-green color is due to annual "whitings" that leave suspended mineral solids in its water. The mineral content of the water also makes the lake meromictic, which is quite rare and which has led to intense scientific study of the lake for nearly a century. False-color satellite photograph of the central portion of Green Lakes State Park. The photograph shows the location of the two lakes, the major stands of old growth forest, and the trails that thread this section of the park. Green Lakes State Park is a New York State Park located east of Syracuse in the Town of Manlius. The park is strikingly scenic, and has a "masterpiece" golf course designed by Robert Trent Jones very early in his career. Green Lake itself is perhaps the most studied meromictic lake—one in which layers of water do not mix—in the world. The park preserves the largest stand of old growth forest in Central New York, and Round Lake has been designated as a National Natural Landmark by the U.S. Department of the Interior. The park is centered on two small lakes, Green Lake and Round Lake, which have an unusual blue-green color. These lakes lie at the base of a gorge that is somewhat longer than a mile in length. The lakes and the gorge are remnants of the ice ages, and exemplify some of the unusual geology of upstate New York. Green Lake has a surface area of 65 acres and a maximum depth of 195 feet. Round Lake has a surface area of 34 acres and a maximum depth of 170 feet. The park's area is 1,955 acres (7.91 km2), and it logs about 800,000 visitors each year. Nearly half the park's area is old-growth forest, which includes many very large specimens of tuliptrees, sugar maples, beech, basswood, hemlocks, and white cedars. One particularly impressive grove of trees, lying immediately to the southwest of Round Lake, has been called the Tuliptree Cathedral. At its northern end, Green Lake has a sandy swimming beach, lawns for sunbathing, and a building with changing facilities and a concession stand; Green Lake is certainly one of the most popular swimming beaches in Central New York. Adjacent to the beach, there is a boathouse with rowboat and paddleboat rentals in the summer season. Currently, Green Lakes is offering stand up paddle board classes, excursions, and yoga taught by Method 360; privately owned boats and paddle boards are not permitted. The park has an 18-hole golf course designed by Robert Trent Jones, as well as a clubhouse in its southeastern quadrant. Above the western cliffs along Green Lake there are a Frisbee golf course, 137 campsites, and eight cabins for those who prefer a less rustic experience. There are several formal picnic areas throughout the park, including some with picnic shelters that can be reserved for groups. There is an extensive network of hiking trails throughout the park, including about 10 miles (16 km) of cross-country ski trails. Some of the trails are also available for mountain biking. The development of the lake area is mostly contained at its northern end. The western shoreline of Green Lake is undeveloped, and Round Lake itself is essentially in wilderness. Of this region, Mary Notarthomas has written that "When walking on the lake trails, one is cradled between the rich, vibrant, almost alien blue-green waters on one side and thickly vegetated, steep wooded inclines on the other." Together, North Lake Trail and Round Lake Trail make a level loop of 3.25 miles (5 km). The park includes many bike trails, most of which are at the western edge of the park. These connect with the Old Erie Canal State Historic Park, which runs by the north entrance to Green Lakes State Park (just above the top of the aerial photograph). The Erie Canal, which was abandoned in 1918, is still continuous within this State Historic Park, and the old towpath is now a walking and bicycling path. The Park extends 36 miles (58 km) from the Butternut Creek aqueduct in DeWitt to the Erie Canal Village, which is near Rome. The golf course at Green Lakes State Park was designed by Robert Trent Jones in 1935. Green Lakes State Park has an 18-hole public golf course designed by Robert Trent Jones in 1935. The course was one of Trent Jones' earliest; ultimately, he was credited with designing about 500 courses. In lieu of payment for its design, he was given a ten-year lease for $1.00/year. Jones opened the course on May 6, 1936. He'd invited Gene Sarazen to play an exhibition match with Emmett Kelly, the first course pro; more than 1,000 people came to watch. James Dodson has written of the course that "the original little masterpiece at Green Lakes, where Wendy and I and sometimes the other Dewsweepers slipped away to chase the game among the gloriously mature evergreens and admire the long view over a dark blue glacial lake, to the very foothills of the Adirondacks themselves, remained just about my favorite Trent Jones golf course of all." Trent Jones attended the 50th anniversary of the opening of the course in 1986. The movement to acquire the land around Green Lakes for a state park began around 1924. The history has been described in a memoir by Betsy Knapp. Knapp, a descendant of the family that acquired and farmed this area in the early 19th century, noted the particular role of Harry Francis, then a professor at the New York State College of Forestry at Syracuse University (now the State University of New York College of Environemtal Science and Forestry). In October 1927 725 acres (2.93 km2) were purchased for the new park. In 1929, the Administration Building was built according to plans by Laurie D. Cox, a prominent landscape architect (and Hall of Fame lacrosse coach) who was active in the design of several New York state parks. The first superintendent of the park, Arvin Henry Almquist, lived there for four years. The building, which had been boarded up for many years, was re-opened in 2008. Green Lakes was a worksite for Civilian Conservation Corps project SP-12 and for companies 1203 and 2211 (veterans). The photograph records the construction of the camp barracks around 1934. After US entry into World War II in 1941, the barracks were used to house German prisoners. During the Great Depression (1929–1939), the New York State Department of Conservation (under the administration of then-governor Franklin Delano Roosevelt) and later the Civilian Conservation Corps (CCC) constructed the park's roads, buildings, cabins, golf course and trails. CCC camps for project SP-12 were created on the property of the park. CCC company 1203, and subsequently 2211 (a company of veterans of the 1898 Spanish–American War), were assigned to the project. These men hauled loads of sand from Sylvan Beach (on nearby Oneida Lake) to create a sandy beach; they dug the basements of the park buildings by hand. The CCC also constructed barracks, dining halls, etc. for its own use. These facilities were closed in 1941. A reunion of the CCC companies who had worked in Central New York was held at Green Lakes in 1988. The CCC camp was reopened in 1944 during World War II to house wartime farm workers from Newfoundland. In 1945 it became the Fayetteville Camp for German prisoners of war. Fayetteville Camp was a branch of Pine Camp, which was located on the site of the present Fort Drum near Watertown, New York. The camp was closed again in 1946 when the prisoners were repatriated to Germany. Since the original purchase of land in 1928, the park has increased to 1,955 acres (7.91 km2). There were additional acquisitions of land in 1960, 1975, 1995, and 1996. Plans to add an additional 1,000 acres (4.0 km2) to the park have apparently been frustrated. 261 additional acres were acquired in 2019. In 2008, the bathhouse near the park's swimming area and beach was demolished, and a new building was constructed to replace it at a cost of about $2.3 million. The building incorporates changing facilities, restrooms and showers, a snack concession, and a meeting room. View of Round Lake looking northeast along the glacial meltwater spillway towards Green Lake. 1002 acres in the western half of the park is designated as a Bird Conservation Area. Improve the Rolling Hills Campground in the short term. In the long term the campground will be relocated to an area south of the park office. While the large white-tail deer population in the park is a problem, bow hunting is excluded; some local groups have called for bow-hunting of deer in the park as a partial solution. A submerged reef at Deadman's Point; the reef built up over the years from the annual "whiting" events in Green Lake, during which calcium carbonate precipitates out of the lake's waters. The cliffs surrounding Round Lake are about 150 feet (46 m) high, but the rocky gorge in which the lake lies is much deeper than this. The bottom of Round Lake is about 180 feet (55 m) below its surface. Round Lake's bottom lies in sediments which may be another 150 feet (46 m) deep. There is thus nearly 500 feet (152 m) gouged out of the bedrock here. This deep gorge was formed towards the end of the last ice age, about 15,000 years ago, by an enormous river of water. The river originated in the melting, retreating ice sheet, and it flowed east through this channel on its way to the sea. The Niagara River gorge lying below Niagara Falls is an active example of this type of gorge formation; its depth is about 326 feet (99 m), which is somewhat shallower than that at Green Lakes. There are several other similar gorges in the same region as Green Lakes State Park, in particular at Clark Reservation, at Smoky Hollow (1-mile (1.6 km) south of Clark Reservation), and at Pumpkin Hollow (about 10 miles (16 km) west of Clark Reservation). Geologists call these gorges and hollows "the Syracuse channels." Deadman's Point at Green Lake. "Marl reef", bacteria formed chalky shoreline formations, are visible in the foreground. Green Lake and Round Lake are probably the remnants of the "plunge pools" of enormous waterfalls that existed during this era. However, the presence of two distinct lakes is not fully understood. As expected for plunge pools, the lakes are fairly deep in comparison to their area. For example, Round Lake is 180 feet (55 m) deep, and has a diameter of about 700 feet (213 m). Nearly half of the water that enters the lakes comes directly through the bedrock in which the lakes are embedded. This water contains a heavy load of dissolved minerals that are not present in water that enters through the surface from rain and snow. The high concentration of sulfur in the deep waters had already been reported by 1849; the lakes' waters also have a high concentration of calcium and magnesium. This mineral concentration leads to "whiting" events each year in which small crystallites of calcite and other minerals precipitate from the water. At these times of year the lakes appear particularly green, and the small crystallites are deposited in a layer underneath the lakes' waters. The notable shoreline "reef" at Deadman's Point (see photo) on Green Lake was built up by this precipitation over thousands of years. Underneath Deadman's Point there are some extremely rare aquatic mosses and sponges. Nearly all lakes undergo mixing of their deepest waters with their surface waters at least once a year. This mixing does not occur for Green Lake and Round Lake. They are rare, meromictic lakes. Waters deeper than about 55 feet (18 m) do not mix with the surface waters; as a consequence, they are essentially devoid of oxygen, and are rich in calcium, magnesium, and sulfur. The meromictic character of the lakes is due both to their relative depth compared to their area, and to the influx of mineral rich ground waters. Because of this lack of physical mixing, as well as the absence of growing plants or crawling animals in their oxygen-depleted depths, the deep bottoms of the lakes have relatively undisturbed annual layers of sediment (or varves) that preserve a historical record, somewhat like tree rings do. These varves are being used to study the climate of this area of New York over the last several thousand years. ^ Thompson, Joel B. (2000). "Microbial Whitings," chapter (pp. 250-261) in Microbial Sediments, edited by Riding, Robert E. and Awramik, Stanley M. (Springer, 2000). ISBN 978-3-540-61828-7. ^ "State Park Annual Attendance Figures by Facility: Beginning 2003". Data.ny.gov. Retrieved February 16, 2016. ^ a b Hilfinger, Martin F., Mullins, Henry T., Burnett, Adam, and Kirby, Matthew E. (2001). "A 2500 year sediment record from Fayetteville Green Lake, New York: evidence for anthropogenic impacts and historic isotope shift," Journal of Paleolimnology, Vol. 26, pp. 293-305. ^ a b "Green Lakes State Park: Old Growth Survey". The Earth Renewal and Restoration Alliance (TERRA). Archived from the original on 2007-09-27. ^ "Round Lake" entry in registry of National Natural Landmarks. National Park Service website. Retrieved December 11, 2006. ^ a b "Green Lake Trail and Round Lake Trail Loop in Green Lakes State Park". hikespeak.com. hikespeak. Retrieved March 22, 2017. ^ "Parks at a Turning Point: Restoring and Enhancing New York's State Park System" (PDF). Parks & Trails New York. November 2006. Archived from the original (PDF) on 2008-04-20. ^ "Green Lakes State Park". championtrees.org. Archived from the original on 2007-09-27. Contains links to the individual survey data. ^ Notarthomas, Mary (2006). "Green Lakes on the Allegheny Plateau". Travel Talk Radio Network. Archived from the original on 2007-09-29. ^ Cornish, Geoffrey S.; Whitten, Ronald E. (1993). "Robert Trent Jones (1906 - 2000)". The Architects of Golf. Harper-Collins. ISBN 0-06-270082-0. Archived from the original on 2007-08-13. ^ Wagner, Chris (May 5, 2011). "The Course of History: Green Lakes golf celebrates 75th anniversary". Syracuse Post-Standard. p. B-1. The link to the article also leads to a video interview with Rocky Kelly, the long-time head pro of the course. ^ a b c Petty, Warren R. (1991). "Green Lake State Park". People and Places: Fayetteville, Manlius, Minoa and Neighbors Volume II. Manlius Historical Society. pp. 127–144. ISBN 1-55787-090-X. OCLC 16228076. ^ Knapp, Betsy (1989). Rocks, Fields And Beauty Forever: One Family's Memories of Fayetteville's Green Lakes. OCLC 31067634. .
^ "New York's Heartland: The development of the state parks program in central New York 1925–1950" (PDF). The Preservationist. New York State Office of Parks, Recreation, and Historic Preservation. 8 (1): 14–19. Spring–Summer 2004. Archived from the original (PDF) on July 27, 2008. Retrieved July 9, 2009. ^ Herron, Frank (June 27, 2004). "Building Green Lakes State Park: A 1929 Structure Served Several Purposes". Syracuse Post Standard. p. H1. ^ a b Hiltbrand, Robert W.; Lyons, Thomas B. (March 23, 2011). "Final Master Plan/Final Environmental Impact Statement for Green Lakes State Park" (PDF). New York State Office of Parks, Recreation and Historic Preservation. Retrieved 2011-08-17. Links to the figures and appendices are at "Public Documents". New York State Office of Parks, Recreation and Historic Preservation. Retrieved 2011-08-17. ^ "CCC Camps New York". CCC Legacy. 2005. ^ "150 Spanish War Vets at CCC Camp Leave for Ft. Dix: Finish Many Green Lake Park Improvements in 3-year Stay" (PDF). The Fayetteville Eagle-Bulletin. November 14, 1941. p. 8. ^ Kirpatrick, Kathy (2010). "POW Camps in New York". Archived from the original on 2011-08-19. Kirkpatrick has published her work on prisoner-of-war camps in Prisoner of War Camps Across America. GenTracer. February 23, 2013. ASIN B00BKNPS4O. ^ "Information Packet for Draft Master Plan and Draft Environmental Impact Statement Public Information Meeting Green Lakes State Park" (PDF). New York State Office of Parks, Recreation, and Historic Preservation. July 7, 2009. Archived from the original (PDF) on March 20, 2010. ^ Petty, Warren R. (1991). "Green Lake State Park". People and Places: Fayetteville, Manlius, Minoa and Neighbors Volume II. [url=http://manliushistory.org Manlius Historical Society]. pp. –27–144. Petty indicates that the 1960 acquisition was by eminent domain from its owners Howard and Robert Cross. ^ "New York State Will Enlarge Green Lakes Park". Eagle-Bulletin and Dewitt News-Times. 85-12 (4). January 24, 1974. Parts of the "Amos tract" were purchased at the southwest border of the park, and in the immediate watershed leading to Round Lake. ^ a b Smith, Robert L. (December 28, 1995). "State Buys Land as Buffer for Green Lakes". The Syracuse Post-Standard. Ms. Betsy Knapp left a bequest to the park of 17 rolling acres at its southern edge, between the Signal Hill and Golden Acres neighborhoods of Fayetteville. The parcel consists of land that Knapp's great-great-grandfather David Collin III began farming in 1817, and incorporates a rare outcropping of dolomite known as Indian Oven Hill. ^ "State Adds 278 acres (1.13 km2) to Green Lakes Park". Syracuse Post Standard. December 15, 1995. The State of New York paid $2.16M to purchase 278 acres (1.13 km2) at the western boundary from William Camperlino. ^ Weiner, Mark (January 29, 1996). "State Adds 126 acres (0.51 km2) to Green Lakes Park; Farmland is Purchased on North Side of Park". Syracuse Herald Journal. The State of New York purchased land along the northern side of the park from the estate of the Teske family. ^ Young, Lauren (January 21, 2019). "Green Lakes acquires 261 acres of land". EAgle News Online. ^ Nolan, Maureen (October 1, 2008). "Green Lakes Gets a New Bathhouse". Syracuse Post Standard. Retrieved July 9, 2009. ^ Mulder, James T. (August 29, 2010). "Hunting ban is likely to stay at Green Lakes State Park". Syracuse Post-Standard. ^ a b c Hilfinger, Martin F.; Mullins, Henry T. (1997). "Geology, Limnology, and Paleoclimatology of Green Lakes State Park, New York" (PDF). In Rayne, Todd W.; Bailey, David G.; Tewksbury, Barbara J. (eds.). Field Trip Guide for the 69th Meeting of the New York State Geological Association. New York State Geological Association. ISSN 1061-8724. ^ Van Diver, Bradford B. (1980). Upstate New York: Geology Field Guide. Dubuque: Kendall/Hunt Publishing Company. ISBN 0-8403-2214-3. ^ Allmendinger, R. W. (2005). "Syracuse Channels". Archived from the original on 2010-03-20. ^ Allmendinger, R. W. (2005). 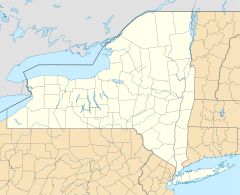 "Finger Lakes from the Northeast". Archived from the original on 2010-03-20. Visualization looking across the Syracuse channels from the northeast. ^ Takahashi, T., Broecker, W., Li, Y. H., and Thurber, D. (1968). "Chemical and isotopic balances for a meromictic lake," Limnol. and Ocean. 13, pp. 272-292 (as discussed in Hilfinger and Mullins). ^ Thompson, J.B., Schultze-Lam, S., Beveridge, T.J., Des Marais, D.J. (1997). "Whiting events: Biogenic origin due to the photosynthetic activity of cyanobacterial picoplankton," Limnology and Oceanography 42(1), 133-141. Wikimedia Commons has media related to Green Lakes State Park. New York State Parks: Green Lakes State Park, official State of New York website for the park with contact and camping reservation information. Green Lakes State Park Golf Course webpage with contact information, times and fees. "Map of Green Lakes State Park" (PDF). New York State Office of Parks, Recreation, and Historic Preservation. July 7, 2009. p. 3. Archived from the original (PDF) on March 20, 2010. "The Underwater World of Green Lakes", video obtained using a robotic submarine by Dr. Mark A. Teece. Photographs by Matthew Conheady at Green Lakes State Park. CNY Heritage Digital Library, featuring photographs taken by Arvin H. Almquist, the original superintendent of Green Lakes State Park, during the park's development (1929–1948). This page was last edited on 7 March 2019, at 20:19 (UTC).